Usually when I go to the grocery store, I buy pasta sauce in bulk, because it’s SO nice to have on hand for quick and easy dinners. But every so often I’ll go to grab a jar for dinner only to find I haven’t restocked my pantry! Luckily, putting together a homemade pasta sauce is just as easy as grabbing a jar! (Well, kind of, but it’s definitely close!) This pasta sauce recipe has a little spin on it though, because I added a little bit of sweet potato puree. Having three little kids I’m always trying to sneak in extra nutrients, plus it gives this pasta sauce a nice sweetness as well as a rich taste! In the Magic Bullet Blender, add your softened sweet potato. Blend until creamy. You can add a few tb. of water as needed to puree easily. In a saucepan on low medium heat, add your EVOO. Then add your onions and garlic. Cook 3-5 minutes until translucent. Next add in your rosemary and cook for an additional minute. Once that is done, add in the rest of your ingredients, including the sweet potato puree. Whisk until combined, and adjust seasonings. 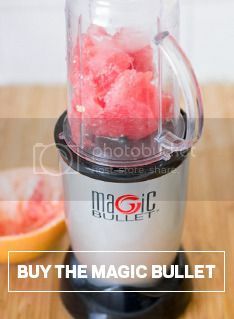 You can puree the sauce into the Magic Bullet Blender for a non-chunky sauce, or leave as is. Feel free to make this a meat sauce as well for a hearty pasta dinner for your family!